Someone really needs to develop scratch and sniff on the internet. Smells are so evocative, particularly in relation to food. The aroma of a dish gets to you even before the taste. At Christmas, the spicy scent that for me conjures up the season is undoubtedly Cinnamon. It is present in so many of our sweet Christmas favourites. Mince Pies, Eggnog, Cookies, Mulled Wine and Figgy Pudding. Schwartz one of the world’s largest producers of dried herbs, spices and seasonings, have launched a 'Christmas Is Cinnamon' campaign for the festive season. 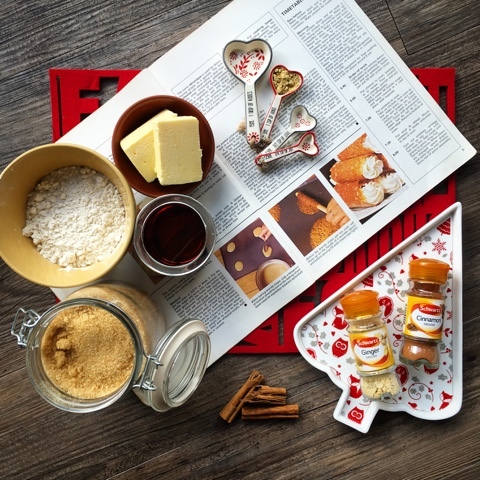 Because they know that this particular spice evokes lots of lovely memories of Christmases past, they asked me to create and share a sweet, festive recipe that has significance to me. The one that immediately came to mind was Brandy Snaps, from my Mum's Cordon Bleu Cookery Course. I vividly recall helping my Mum to make Brandy Snaps at Christmas time. The recipe she used was from the Cordon Bleu Cookery Course. This was a 72 part cookery magazine from the 1970's. The Brandy Snaps take pride of place on the cover of the first issue of the magazine (priced at a hefty 75p). They are the suggested desert for your very first Cordon Bleu Dinner Party Menu which comprised of: Potage Madrilene to start, followed by Chicken Veronique with Julienne Potato Cake and rounding off with Oranges in Caramel and the ubiquitous Brandy Snaps. To enable you to 'make the meal a success without wasting a single precious second in the kitchen' a detailed timetable was provided to make it possible for even 'a beginner cook to produce a Cordon Bleu meal'. When it came to Brandy Snap making at Christmas it was always for a large gathering of friends on Christmas Eve. We used to unearth all the wooden spoons and spurtles in the house to shape them around. Asbestos fingers were definitely required as there is a very fine line between the brandy snaps being too hot to handle and having cooled so much that they break when you try to roll them. My Brandy Snap Baskets are definitely an evolution of a later decade and are much less fiddly to make. The combination of Ginger and Cinnamon is always a winning one, although I was somewhat surprised to discover that most Brandy Snaps don't actually include any Brandy in the recipe! A wee bit of Googling led me to discover a few possibilities for the name. One being that the cream they are filled with should be flavoured with brandy another that brand-schnap came from them being burnt gingerbread and a third that uneducated palates made the use of brandy redundant thus manufacturing the biscuits without brandy was cheaper! Whatever the true origin of the name, Brandy Snaps most definitely encompass the sentiment of 'Christmas is Cinnamon' for me. Put the butter, sugar and syrup in a saucepan and and heat gently until the butter has melted and the sugar has dissolved. This will take about 15 minutes over a low heat. Don’t let the mixture boil as it may crystallise. Leave the melted ingredients to cool slightly then sieve in the flour, salt, cinnamon and ginger. Pour in the lemon juice and vanilla extract and stir well to combine. Line two baking sheets with greaseproof paper or a reusable non-stick liner. Spoon the mixture into 4 'blobs' on each sheet. Space them well apart as they will spread. Cook for 8 – 10 mins until set, golden brown and lacy in appearance. It's best to do this in two batches. To make baskets, oil the base of small ramekins or dariole moulds and drape the biscuits over them. Once set, transfer to a cooling rack. If not using straightway, store in an airtight container for up to 7 days. 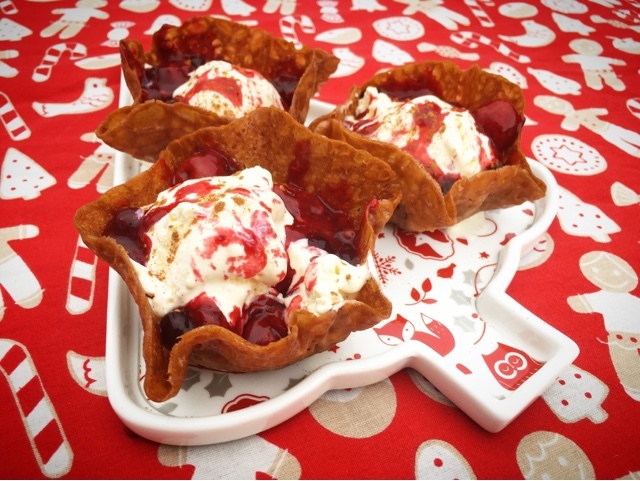 Serve the Brandy Snaps Baskets filled with whipped cream (with or without Brandy) or ice cream. Top with your choice of fresh fruit, berries, fruit, toffee or chocolate sauce or try my seasonal Mulled Fruit Compote. Gently heat the frozen summer fruits in a saucepan until they are fully defrosted and there's plenty of juice. Slake the cornflour with a splash of water and add it to the pan, mixing well to combine. Turn up the heat and allow the sauce to thicken. 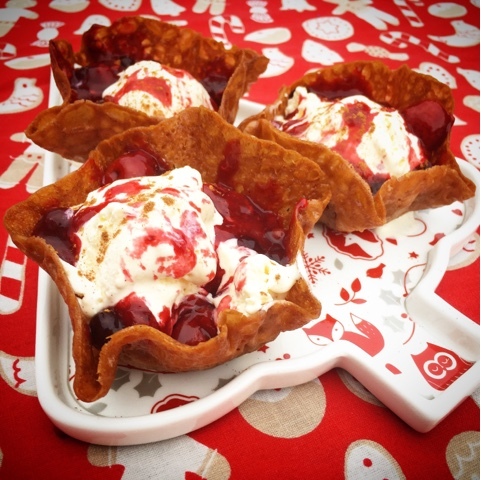 Serve in the Brandy Snap Baskets along with cream or ice cream and finish with a sprinkling of Cinnamon. Disclosure : This is a commissioned post for Schwartz. As always, all views expressed are my own. Ah! These little bowls look absolutely delicious! I love trying new sweet recipes, added this to my list of new ones to make this year! Thank you! What could be better than a desert where you get to eat the bowl?! Oh what lovely Cinnamon memories! We were in Florida in October and I too discovered the awesomeness that is Cinnabon. Oh these are so pretty. I love such memories from my childhood with my mom. I love the combination of ginger and cinnamon too! Ginger and Cinnamon really are a match made in heaven. Essentials for festive baking. Oh how I love cinnamon, it definitely is the scent of the season! These brandy baskets look absolutely delicious too! The 'Scent of the Season' love it! I promise that the baskets are indeed delicious. I was only thinking about brandy snaps the other day. Now it is December, it's time to start eating them! There are so many good things that we are allowed to legitimately eat now that December is here! I have never been able to make brandy snaps let alone baskets out of them. Very impressive indeed! The baskets are definitely easier than the rolls. Do give them a try, the taste and crunch is incomparable to shop bought. I would love to try making brandy snaps - I think it's time! They are less tricky than you would imagine. The trick is to have everything ready for them coming out of the oven and to not be scared to pop them back in if they start to get brittle. Gorgeous, and I've got a feeling I'd LOVE that Cordon Bleu Cookery Course! I was going to tag you on Twitter to make sure you'd seen this. The Cordon Bleu Cookery Course is indeed a joy to behold. Something for you to work through once you have finished the complete works of Fanny?? As a kid I used to always hope that there would be some leftover from my parents dinner parties! Oooh these brandy snaps look wonderful! I can practically smell the spices from here. The retro cookbook sounds amazing too. There's a whole series of the Cordon Bleu cookery course as there were 72 parts! Not sure if my Mum has kep them all but there are sure to be some other gems. This is an adorable post, Claire! I love looking at old cookbooks and food magazines (hilarious and inspiring in equal measure) and being reminded of "oldies but goodies". 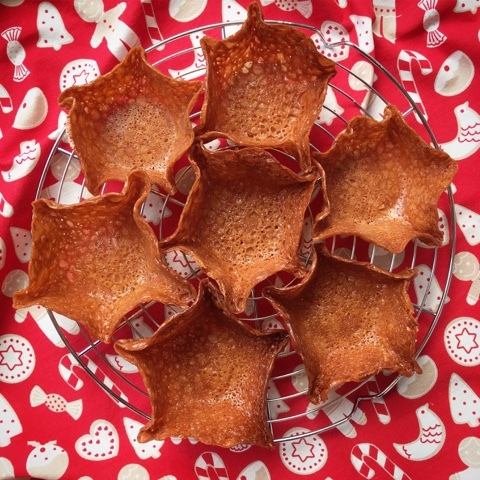 I've never had the patience for brandy snaps but these look pretty darn straightforward - and with no need for gathering up all the wooden spoons first! I make taco cups this way (over bun tins, not spoons ;_0). 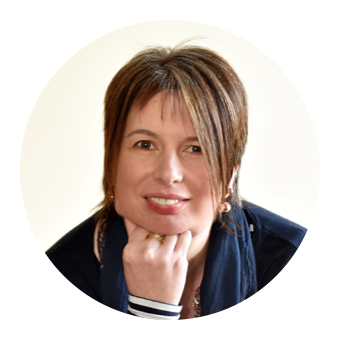 I hope you are enjoying the lead up to Christmas. It seems like it! Oh I now want to make taco cups! 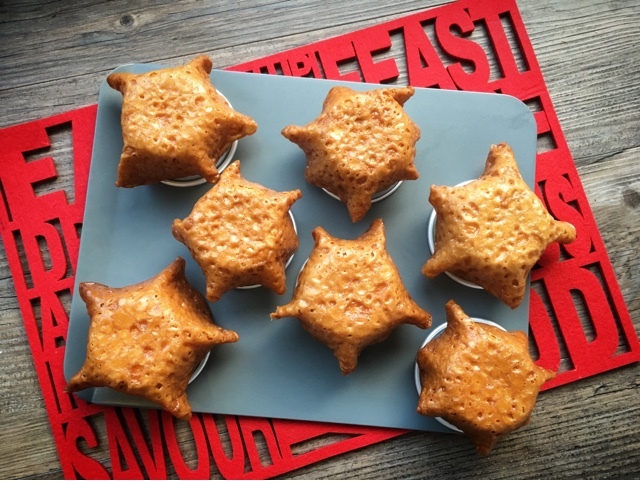 I did initially try the brandy snaps over bun tins but they all fused together and I had to go back to the drawing board! Can't believe how quickly Christmas is coming round! Eek! you've just whizzed me back the early 1980's!!! I used to LOVE brandy snaps, never in a million years would have considered making them for myself. Nice one Claire, guess what I'll be doing this Christmas!!! Honestly homemade ones taste so much better than shop bought. The flavour and crunch is amazing! I'm making these for xmas - they look brilliant! Brilliant - do let me know how you get on with them. Think I'll have to make another batch. The baskets are definitely easier to make that the rolls and the ability to re-soften the biscuits in the oven if they get too brittle give a wee bit of breathing space! The curls are a wee bit more fiddly to get perfect but the informal shape of the bowls makes them more forgiving! 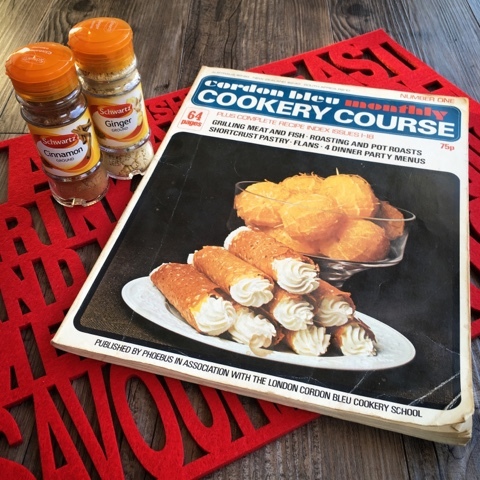 Oh wow, the only times I've ever made brandy snaps, the recipe came from that magazine too! Instant flashback! I haven't thought about making them for years but suddenly I have a hankering to make vegan ones! Thank you for the inspiration! Also, I love your measuring spoons - where are they from? They look so Alpine! Oh wow! I love that you made some from that magazine too. Glad to have given you a foodie flashback. The measuring spoons were from Matalan a couple of years ago but thay have similar this Christmas. The flavours are so Christmasy but they would be perfect for a year round desert. Great in the summer with strawberries and raspberries. I think I'd want the ability to be be able to turn off and on the smelly facility on blogs! I absolutely love brandy snaps (I've already eaten a couple this evening as it happens), but I've never tried making my own. I love the sound of your compote too, I'd imagine it goes perfectly with the ginger. Do give the baskets a try, they are much easier to make and more forgiving than the traditional rolls. There is so much nostalgia to me about this recipe and the whole Cordon Bleu cookery magazine series.